Show.kit is a powerful, yet easy-to-use template based Flash websites kit. It lets you create Flash and HTML websites, Flash presentations, Intros and preloaders. It is so easy to build professional web output in Show.kit - make just few changes in a well-made template and upload it to your server automatically. 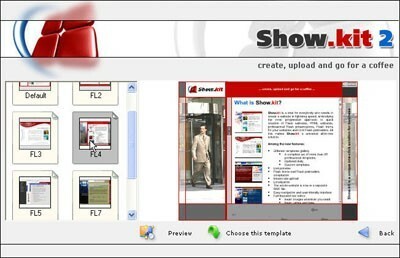 Show.kit has a special set of features for templates customization. Text editor will let you insert images, create tables, customize formatting and do other customizations in text field. You can also edit images and apply various effects to them, like fading, blur, mosaic etc. Show.kit features full MP3 sounds support for adding your own music to the Flash project, and a full in-slide sound control so that you and your visitors can easy adjust sound settings. If you don't have time or possibility to learn web development and need easy and fast, yet professional and reliable solution, Show.kit with its user-friendly interface will be the best tool for you to achieve your goals. Additionally, all registered users gain FREE access to special Show.kit Extras area with unlimited downloads of images, sounds, logos, and uber-handy free plugins, like CD Burner, Sound Editor, Replace Color, etc. * Build professional Flash/HTML websites, Flash presentations, Flash Intros and preloaders with one product! * Unique project navigation and customization with easy-to-understand and easy-to-navigate project tree. * Multiple fully customizable templates for all types of projects, online templates gallery with endless downloads. * Additional downloads of images, sounds, logos, etc. in unique Show.kit Extras area. * Full MP3 sound support in all projects (Flash/HTML websites, Flash presentations, Flash Intros, Flash preloaders). Add your own music and sounds, or select any from the gallery - and enrich your website with music. * Unicode support: create websites and presentations in your native language (except for right-to-left languages). * Keep your projects organized with a separate Show.kit file format. * Full in-slide sound control: let your visitors adjust sound settings with ease. * Multiple color schemes to select from in your project: save your time and select one of professionally created color schemes that will make your website stand out. * Handy image editor: edit images and apply various effects like fading, blur, mosaic and more. * Professional text processor: insert images, create tables, customize formatting, select any font, search and replace, and more. * Live preview with unique Flash movie controls. * Automatic FTP upload with multiple FTP sessions. * Great FREE additional plugins like: CD Burner, Sound Editor, etc.